Largehearted Boy: Book Notes - Summer Brennan "The Oyster War"
Book Notes - Summer Brennan "The Oyster War"
"Every story is freighted with backstory, with multiple and intersecting histories. The great value of Brennan's book, even if it gets, as she writes, only 'as close to the truth as I could reasonably be expected to come,' is her deeply probing effort to understand and craft as full and complex an account as possible." 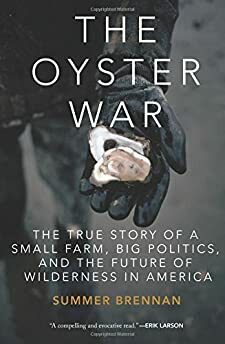 The Oyster War was born to Top 40 radio, driving the world's ugliest car on winding country roads between oyster farms and shipwreck-marked beaches and the one room newspaper office where I worked. It was the summer of 2012. The book started as a long series of questions I asked to myself out loud and recorded on my iPhone 3's Voice Notes app. I drove with the device resting in my lap but it sometimes went flying onto the floor if I took too sharp a turn. With almost non-existent shocks, the car bounced like the baddest lowrider but was, in fact, a tan 1991 Pontiac minivan with a cracked windshield and Canadian plates. A friend nicknamed it "the Man-Repeller." Because I had music on, the recordings of these questions to myself—about oyster farmers and fraud and a possible government conspiracy—were half shouted over songs like Carly Rae Jepson's "Call Me Maybe," Katy Perry's "Wide Awake" and Nicki Minaj's "Starships." If there wasn't music on in the background of my recorded notes, there was the rushing wind of the beaches where I walked during stolen hours, describing waves and seaweed to myself. I never listened to music when I was out in nature, and I never felt like I could relax fully unless I was right at the water's edge. Then, I didn't need the distraction of music to carry my thoughts along. I didn't need anything. Autumn came, and I went back to the city. Those Voice Notes became notes in a Mead composition book, then some rambling Word documents, and eventually a few stabs at the outline of a book. I returned to California the following summer (this time driving a different, better car). I had interest from a publisher but nothing set in stone. The radio songs of note were "Radioactive" by Imagine Dragons, Ellie Goulding's "Burn," and Miley Cyrus's "Wrecking Ball." I noted a semi-apocalyptic theme. The work still involved a lot of driving. I finished my book proposal in December 2013, in a snowed-in coffee shop near Brooklyn's Prospect Park. Mostly I was listening to HAIM's "The Wire" (I guess because I felt I was down to the wire?) and open-source film score music by Dexter Britain, especially different versions of the track "Time To Run." I liked this because it helped me to image the book as a movie, which somehow helped me to more fully realize my idea as a book. While my agent was pitching the proposal to editors, I listened to Vashti Bunyan's "Window Over The Bay" and "Come Wind Come Rain," trying to remain calm as the flattering rejection emails came in and winter thawed into a soggy early spring. We sold the manuscript in March. Back in California once again in May of 2014, I asked people on Twitter to recommend music that "sounded like fog." This is how I discovered Stars of the Lid, particularly the album And The Refinement of Their Decline. I listened to it over and over and over again, but only while writing, and would continue to do so whenever I needed to work on a passage that took place in nature. It was like dropping into a trance. The Oyster War required many, many hours of research. Searching through archives for information on nineteenth century sailors and oyster pirates, I often (incongruously) listened to "Gloria" as sung by Laura Branigan, and "867-5309/Jenny" by Tommy Tutone—accidentally blasting the latter for three horrible seconds in the reading room of the New York Historical Society when I opened up my laptop without first plugging in my headphones. When writing about the roots of environmental direct action, I listened to "For What It's Worth" by Buffalo Springfield and "Instant Karma" by John Lennon. Turning to the political maneuverings of the 1970s, I fell for the version of "White Rabbit" sung in Arabic by Mayssa Karaa. I also listened to Jefferson Airplane's "Somebody To Love" and Queen and David Bowie's "Under Pressure" in the same short playlist. When writing about forest activists of the 1990s like Julia Butterfly Hill, I listened to the operatic "Song of Captivity" and "Freedom" by Murray Gold (which is so lovely, you'd never guess it was written as the theme music for a tentacle-faced alien race on Doctor Who). To get into the head of the extremely debauched and relentlessly ambitious Congressman Phillip Burton, I landed on Hot Chocolate's "Every 1's A Winner." When going through research and organizing my notes at that time, I listened to Sweet's "Fox On The Run" and David Bowie's "Rebel Rebel." Sometimes the music I listened to related to what I was writing about in mood or subject, but oftentimes not. Often the songs were just something I injected myself with in order to keep going; mainlining over-the-top glam rock or saccharine pop in order to overcome my exhaustion. The low-point of the entire book-writing process was certainly October of 2014. I'd had writer's block for months at that point and had to battle for every sentence. Then I had a breakthrough. Well, actually a few things were breaking: my self-doubt, my publisher's patience … other things. Possibly my sanity. I broke up with the guy I had been seeing (or perhaps he broke up with me). I started scribbling ideas and rearranging the book's structure on my office chalkboard wall, with great energy. I joked to someone that I was like Joseph Gordon-Levitt in that scene from 500 Days of Summer, which is how I ended up listening to "Vagabond" by Wolfmother approximately 1,000,000 times. I'm not sure I even really like that song very much, but it was playing in that scene of the movie, which naturally I chose to watch in one last effort at procrastination. I don't especially like (or dislike) Joseph Gordon-Levitt and I did not really like 500 Days of Summer. I actually might hate "Vagabond" by Wolfmother, but for whatever reason it got the job done. For the next month, when I was working I listened to that song and only that song. I hardly noticed. It was background noise, the sound of my engine as whirred along through chapter after chapter. The days flew by and the weekends were a blip. I was working a 50-hour-a-week day job as well but still needed to put in at least five or six hours of daily writing in order to meet my thrice-extended deadline. I got up at three in the morning every day and listened to "Vagabond" and wrote until it was time to throw clothes on and go to the office. After work I stayed at the office and wrote there, knowing that as soon as I got home I would pass out from exhaustion. On my commute from Brooklyn to Manhattan and then back again every day during that terrible month of "Vagabond," I listened to Beyonce's "Halo," also on repeat. I imagined that Bey was singing about a literal guardian angel and visualized that strings were attached to my clothing and the top of my head, holding me upright. During this trying period of "Vagabond" and "Halo," one of my coworkers remarked that my eyes looked like that painting of Joan of Arc by Jules Bastien-Lepage that hangs in The Met, haunted and religiously determined. I never want to hear either of those two songs ever again. When it came time to write the book's last chapter, I remembered once hearing a song with the refrain "all things go, all things go," but couldn't recall anything else about it or who it was by. A Google search revealed it to be "Chicago" by Sufjan Stevens, so I put it on repeat until the book was done.